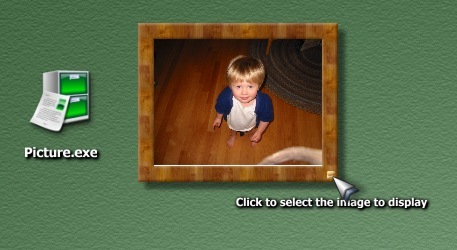 This WIDGET is a picture frame originally created by Martin which lets you change the picture in it by clicking on the little button on the bottom right. Inside the ZIP file is a .exe that you can run as long as you have DesktopX installed. Because it's a widget, it does not need DesktopX to actually be running to use. If you want different options you can load my originals (portrait and landscape), the objects you want and export to a Widget. If you check the "allow multiple instances" you can load the widget more than once.